If you’ve never played pickleball before, it’s like tennis with plastic wiffle-ball-ish balls on a smaller court. It’s an exciting game, with fast-paced action and plenty of strategy involved. Unfortunately many people decide they don’t like the sport after trying out one of the trashy wooden paddles that locations hand out for people to use. Sure they’re cheap to buy and pretty durable too, but they just don’t perform like the best pickleball paddles do. 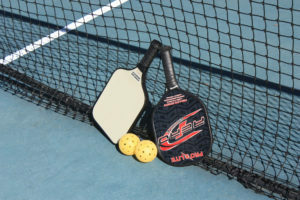 If you’re into the sport at all, you should really think about buying a high quality paddle after spending a bit of time playing with a cheap one. You’ll love the way that your game improves, and how much more comfortable it is to play as well. I spent a full year playing with garbage paddles before I sprung for a quality one, and I kicked myself for not doing so sooner. Pickleball is a blast, and it’s a sport that I play with most friends and family members. Below are some of my all-time favorite paddles, many of which I still use today. Take a look at the options and consider upgrading to a quality paddle as soon as you can after trying the sport. You won’t regret the expense.